Outbuilding of a castle (11th century) at the same distance (20 km) of Liege (Belgium), Maastricht (the Netherlands) and Aachen (Germany). 9 P , 4 bedrooms, 4 bathrooms, 4 toilets. 2Km (5 min) drive from the shops. “Wodémont” is a self-catering holiday rental, tastefully furnished and equipped with all comforts. You will see some of the owner's paintings in the house. The vacation rental consist of a living room of 45 m², a kitchen fully equipped, 5 bedrooms (3 with private bathroom), a TV room with several canals, a ping pong table in the garage, wash machine and dryer in the basement. There is a garden of 3000 m², south-west with BBQ. A little bed and a children chair are available. Tourism in Belgium: Blégny mine, Liège, fort d'Aubin Neufchâteau, Alden Biesen, Verviers, Tongeren, Bockrijk, Limbourg, Reinhardstein, Jalay , Spa, Francorchamp, Stavelot, Huy, American cemetery of Henri-Chapelle, Brussels (125 km or train at 7 km) Bruges (240 km). Activities: Lots of cycle tracks, walking (GR 563),..., Hautes Fagnes, golf, horse riding, tennis, bicycles to let at 5 km (look at the site hereunder. ), Vennbahn, Durbuy aventure. We loved the quiet surroundings, enjoyed the bright living room, oriented to the south, and eating outdoor on the terrace. Lots of good walks and cycling. We took the train in Visé to visit Liege. Be economic with the heating. Our overall experience was great, and we certainly like to come back. House very large, we were a family of 10 plenty of space. Everything you will need is in the house. Very quiet location, needed our cars but we knew that so were prepared, lots of things to do for all the family. We spent 2 weeks staying here. Table tennis is a great addition. Really enjoyed the house and our holiday. Wir waren dort zu siebt, 3 Erwachsene und 4 Kinder im Alter von 2, 8, 13 und 17 Jahren und haben uns sehr wohl gefühlt. Das Haus ist fantastisch ausgestattet, die Raumaufteilung ist super, vor allem auch die vielen Bäder. Der schöne Garten lädt zum Spielen ein. Die Gastgeberin ist sehr freundlich. Wir würden uns freuen, nächstes Jahr wieder kommen zu können. Lieben Dank! Wij zijn nu al vier keer op het domein geweest en het was iedere keer een feest. En Patricia is natuurlijk een heel lieve gastvrouw! Like you can see at the title of this review, we had a nice and pleasant stay at the end of 2014 and beginning of 2015 at the chateau Wodémont in Mortroux, a beautiful spot in the Voerstreek, Belgium. The house is spacious but cosy still. Kitchen, heaters and other facilities work well. We´ve been here before and hope to visit Wodémont again. 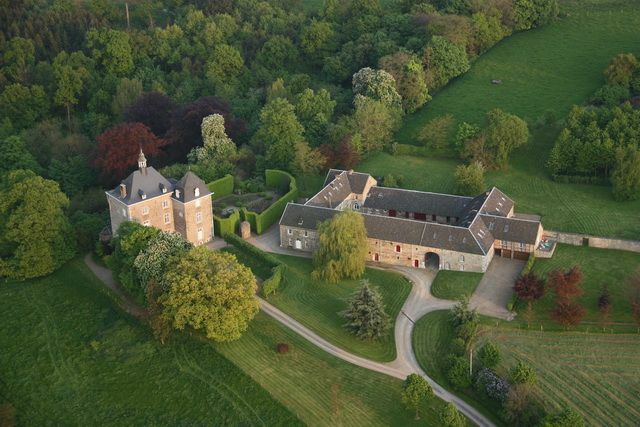 Large house and garden in the Belgium countryside. We have rented self-catering properties for our holidays for many years now in the USA, UK, Belgium and France. The owner kindly waited for us to arrive to show us how things worked. The part of the estate that we rented is large inside as is the part of the garden. Pleasant views of the country side. No vehicle traffic noise, however you may just hear the odd low flying commercial jet late at night. Apart from the oil the utility bills where reasonable and the tariff made clear. The building we rented is essentially just one corner of the large square building you see in the photo. It takes a lot of oil to heat this place. We only had the heating on for mornings and evenings and somehow used one hundred litres in a week! when the temperature was 10-15 degrees outside. This cost us one hundred and five euros. As with most self catering properties in France and Belgium there is only limited cooking equipment. The oven was slow and had no fan or temperature dial. In the upstairs bathroom the shower curtain pole was broken and held up with string. Lino had marks on and was peeling up at the edges. The private driveway which was about three hundred metres long had a few shallow holes in. Just be careful if you have expensive low profile tyres on your car. 60w incandescent light bulbs used throughout, while they provide a nice soft yellow light however they use a fair amount of energy. You can sometimes hear a bit of noise from the neighbour who lives next door through the wooden door in the hallway. You might describe this place as a converted wing of a house. I would recommend you rent this property as it has good views of the countryside, friendly landlady and is spacious inside. Just remember to bring your, slippers, jumpers, mugs and cheese grater. Outbuilding of a castle (11th century) at the same distance (20 km) of Liège (Belgium), Maastricht (Netherlands) and Aachen (Germany). Wodemont is a self-catering holiday rental for 2 to 9 peoples (+1 bed in the TV room) tastefully furnished and equipped with all comforts. A little bed and a children chair are available. The vacation rental consist of a living room of 45 m², a kitchen fully equipped with microwave and dishwasher, 5 bedrooms (3 with private bathroom), a TV room with several canals, a ping pong table in the garage, wash machine and dryer in the basement. There is a garden of 3000 m², south west with barbecue. Tourism in Belgium: Blegny Mine, Liège, Alden Biesen, Jalay,Tongeren, Bockrijk, Limbourg, Reinharstein, Francorchamp, American cemetery of Henri-Chapelle (golf), 115 km to Brussels. Caves of Han 1h15. 1.400 € for 14 nights, 2.000 € for 21 nights . The weeks of Christmas and New Year are charged 850 €. Rates don't include electricity, water and heating. Towels and linen, bed clothes or cover are not provided.. If you don't clean the house after your stay, it is charged 100 €. We ask € 400 as deposit, recoverable at the end of the stay.